Leather Accent Sterling Silver Wristband Bracelet from Bali, "Bali Valor"
Sterling silver chain links are carefully handcrafted along half of this amazing wristband bracelet from Bali. 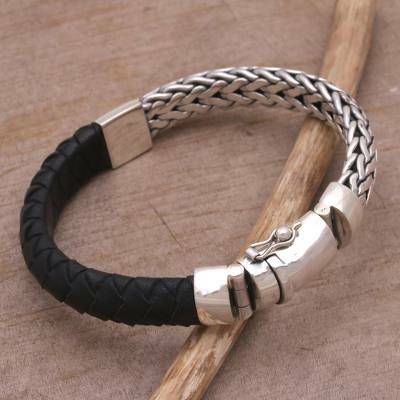 The other half features a strand of hand-braided black leather. Working with local artisans, Cahya Krisna designs the bracelet, closing it with a silver box clasp. "a great piece of jewelry"